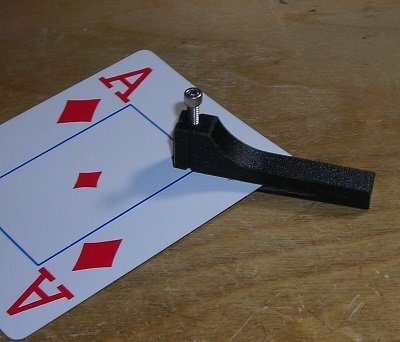 This is a card punch 3D printed from the finest carbon fiber reinforced nylon. A card punch is used to mark cards imperceptible to people who are unfamiliar with it. If you do not know how to use it this item is not for you. There will be no instructions supplied with the item. The primary innovation in this model, besides that it is 3D printed, is a screw-needle combination which makes adjusting the depth of the punch a breeze. Simply turn the screw a bit more in or out to set the needle tip deeper or higher. If you have moderately strong fingers you will be able to turn the screw by hand. Or use a small hex key (also known as Allen wrench) or pliers. The needle is a fine steel needle. Unless you intend to punch thousands of decks it should last you a very long time, in most cases a life-time. If a fine needle prick is too subtle for you to feel you may be interested in the Blistr - a different type of card punch. This card punch is surprisingly compact, light and solid. It leaves a nice prick, visible to eye and finger as it were. This could have utility with an impromptu or borrowed deck situation. Compared to the Pinpoint Pegger it is less expensive and more stable but lacks the settings to duplicate positioning. Still, I think this is something all magicians should get to throw into their kit for that time when they have need of a miracle.